Thu, Apr 11, 2019, 09:26 am SL Time, ColomboPage News Desk, Sri Lanka. Apr 11, Colombo: People's Bank has signed a landmark $200 million, eight-year, bilateral funding facility with China Development Bank, which is one of the largest and the longest tenor funding facilities secured by any commercial bank in Sri Lanka up to now. The signing ceremony was held at China Development Bank's Guangxi Branch in Nanning, People's Republic of China on 27 March. 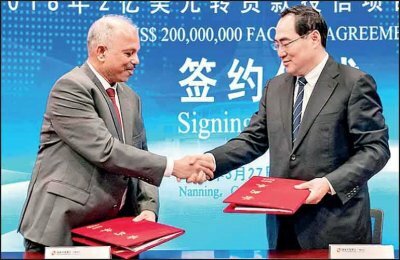 Chief Executive Officer/General Manager N. Vasantha Kumar and Guangxi Branch General Manager Mei Shiwen signed the facility agreement representing People's Bank and China Development Bank respectively. Thereafter several rounds of discussions were held between senior officials of People's Bank and China Development Bank with regard to future cooperation between the two institutions. China Development Bank selected People's Bank to sign an historic Memorandum of Understanding in May 2018 covering areas such as financing, customer referrals, introducing investment opportunities in Sri Lanka and training and experience exchange, etc. The aforesaid facility was signed as a result of this Memorandum of Understanding. Since its inception 57 years ago, People's Bank has opened its doors to customers across the country, and has continuously leveraged its resources to uplift many lives through financial services. With an insight into the financial needs of the citizens, from young to old, People's Bank has constantly strived and committed itself to elevate the living standards of the citizens. Through its massive network of 738 branches island-wide and over 4000 ATM machines and affiliated to Lanka Pay Gateway, People's Bank has reached more than 10 million customers offering a wide spectrum of financial services. The bank also provides its services 24 hours a day, seven days a week and 365 days a year via its Self-Banking Units: amounting over 200 across the island.